Algardi’s erudite and stylistic orientations were profoundly influenced by his teacher Ludovico Carracci. Of equal importance was his experience beginning in 1625, when Cardinal Ludovisi called Algardi to Rome for the restoration and reworking of lost parts from his collection of ancient marbles. Algardi received several important monumental commissions during Bernini’s temporary loss of popularity with the papal court. The Bolognese artist, while appreciative of the innovations of Bernini and the paintings of Pietro da Cortona, was mainly influenced by the ideals of classical composure and balance seen in the works of Domenichino, Guido Reni and Poussin. His contemporaries rated him as the master of classical decorum, as opposed to the ‘unruliness’ of Bernini-influenced sculpture. The artist’s known production is from 1657 to 1700. Working with Pietro Bazzi and his brothers Giuseppe and Giovanni Maria Baratta, he sculpted the column capitals of the Sant’Agnese bell-towers. At the moment when Bernini was assumed as director of the final interior decoration, a decision was also made to complete the facade with a massive coat of arms of Innocent X, to be supported by two angels, and a series of saints to be placed along the height of the trabeation. Andrea Baratta received the commission for these sculptures in 1668 and soon completed the representation of Saint Eugenia, now seen at the corner of the right bell-tower. Unfortunately the commission was suspended in the same year. The records show that Baratta was paid for only the one sculpture, as well for the carving of the angels supporting the arms. Gian Lorenzo developed his great technical virtuosity in the mannerist style in the stone workshops of his father, Pietro Bernini. From there he progressed to devoted study of Greek classical models and the works of the great 16th century masters ‒ influences that appeared early, as fundamental elements of Bernini’s artistic culture. His precocious talent then emerged full-blown in the form of four marble groups sculpted for Cardinal Scipione Borghese between 1619 and 1625. Following the election of Pope Urban VIII Barberini (1623), Bernini rose to the top of the Rome artistic sphere. His fortunes continued without decline, apart from a brief loss of favour at the opening of Innocent X’s reign. His numerous creations represent harmonious fusions of nature, space and urban design, executed in vital forms, giving the impression of ceaseless self-transformation, and of material sublimed as light and movement. Bernini’s prodigious technical skills were guided by an exceptionally fertile imagination, and by complete consciousness of the culture of his times. His vast and widely varied works gave life and form to the ideals, myths, and temporal and spiritual inspirations of 17th-century papal Rome. Borromini probably served a boyhood apprenticeship as a stone-cutter in the fabbrica of the Milan Duomo, under the direction of Francesco Richini. His presence in Rome is known from 1619, however for many years he continued a modest existence as a stone-carver under Carlo Maderno. Eventually he rose to partnership in works for St. Peter’s and palazzo Barberini. It was only in 1634, after the death of Maderno and Bernini’s clamorous success, that Borromini succeeded in obtaining his first independent architectural commissions. The geometric complexity of the artist’s structures derives from the contrasting strengths and tensions at the very heart of his invention: advancing, withdrawing and bending the planes of masonry, in soft and slow, then dramatic and decisive rhythms, imbuing the surfaces with an irresistible thrust within the continuity of the structures. 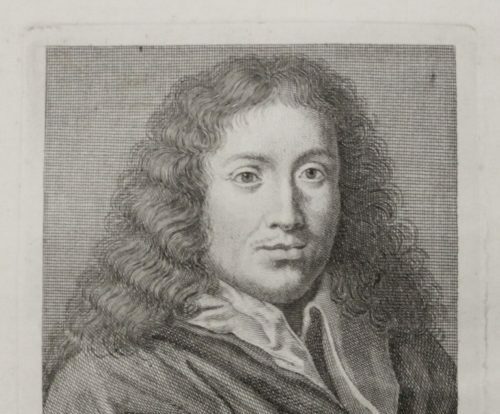 Borromini was stubborn, contentious and oversensitive in his relationships with patrons, and often in opposition to the standards of his times. 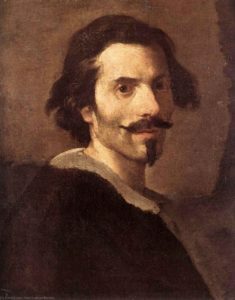 He disagreed bitterly with Bernini ‒ more for contrasts in personal culture and temperament than for truly professional differences. Borromini drew on a figurative lexicon of exceptional breadth, and searched within the ideals of his ‘technique’ for the path to the highest freedom of style. Buratti sculpted the marble relief of Saint Agnes being led to martyrdom, which serves as the decorative focus of her burial crypt. 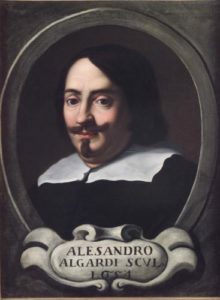 The attribution is confirmed by a 1661 document in the Doria Pamphili family archives, noting that the work was ‘made by Sig. Giov. Buratti, sculptor’. In spite of his brief career, Caffà was one of the innovators of the second Roman Baroque period. 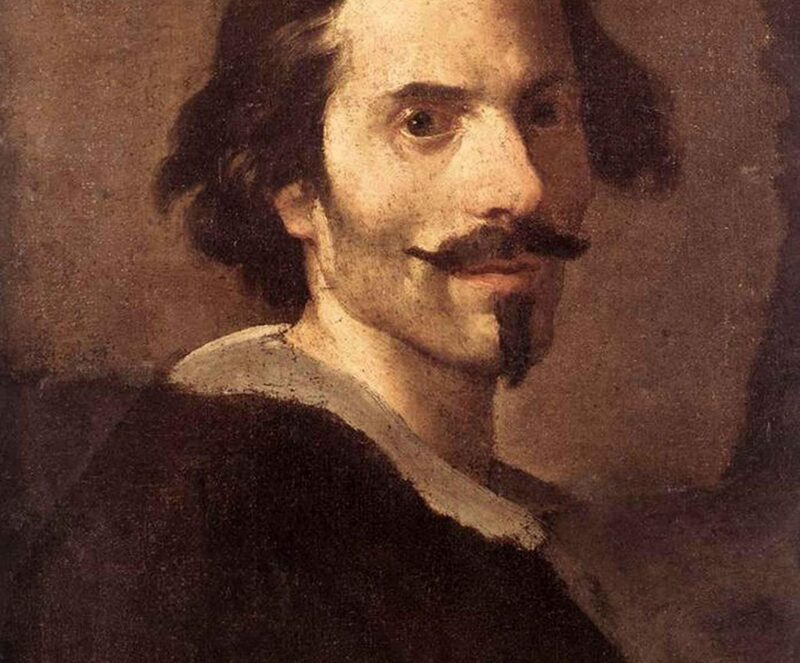 Although a student and collaborator of Ercole Ferrata, his inspiration derived more from Bernini and Baciccio. He reinterpreted such influences with luminous and pictorially perceptive sculptures for the churches of Saint Catherine of Siena and Saint Catherine of Magnanapoli, both in Rome. A native of Como, Ferrata apprenticed with Alessandro Algardi. He later came into contact with Bernini, with whom he collaborated on sculptures for St. Peter’s Basilica. His production for Sant’Agnese and Agone is worked with great sensitivity and plasticity. 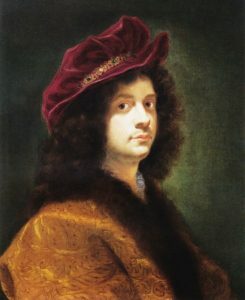 Ferri was a student and assistant to Pietro da Cortona. He was assisting his master with the painting of the famous Hall of Saturn frescos, in Palazzo Pitti, Florence, when the former departed for Rome. 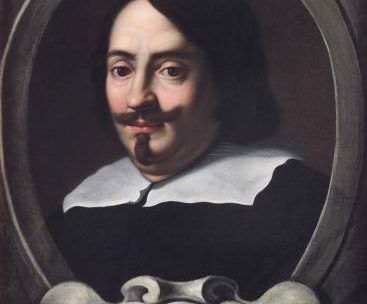 Ferri completed the project, working from 1659 to 1665. 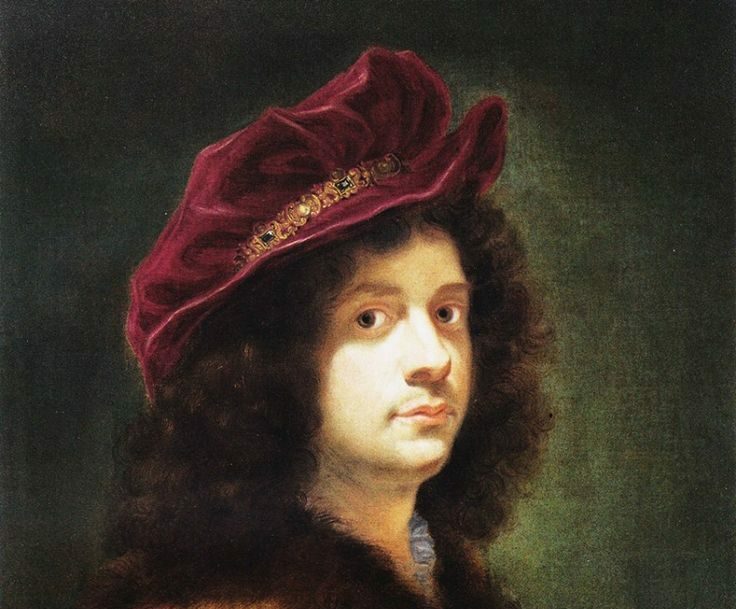 Even after the death of his master in 1669, Ferri continued to adhere closely to his style. Among his greatest works are the Allegories, painted in Villa Valconieri in Frascati. 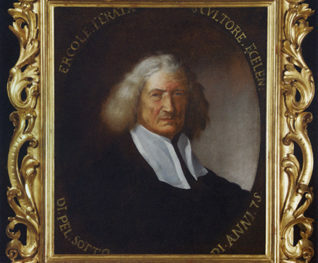 Gaulli arrived in Rome as a relatively young man and remained here for the rest of his life. He was accepted to the Accademia di San Luca, the Rome artists’ guild, where he went on to hold several offices. 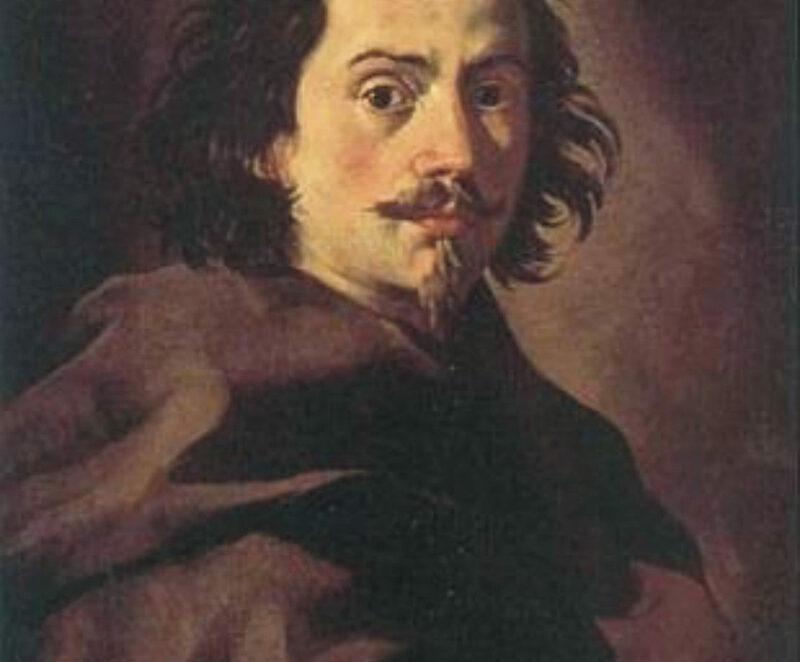 Thanks in part to his friendship with Bernini he became a favourite artist of the religious and civil aristocracies. His main work is the ceiling decoration for the Church of the Gesù, executed from 1672 to 1683, above all for skyward perspective and spatial effects of the Triumph of the Name of Jesus: the fresco blends influences from Caravaggio to Bernini, creating one of the maximum expressions of the Roman Baroque. Baciccio continued this same spirit in an entire series of mature canvases, painted from 1672 to 1675, all of great dynamism and vibrant colour. A native of Lombardy, by 1709 Maini had arrived in Rome, where he entered the workshops of Camillo Rusconi and Filippo Della Valle. He eventually collaborated with Della Valle in the decoration of many churches, expressing himself with elegance and fine modelling. He was elected to the Accademia San Luca in 1724 and in 1746 became a principal. Maini worked in numerous Roman churches, completing statues, marble sculptural groups, and funerary monuments. Among his main works are two statues among the group of ‘Founders of Religious Orders’ in St. Peter’s, the bronze figure of Clement XII in the Corsini Chapel of Saint John Lateran, and the funerary monument of Cardinal Neri Corsini senior, also in Saint John Lateran. He was commissioned for sculptures in Santa Maria Maggiore, Sant’Agnese in Agone and San Luigi dei Francesi. He also produced many designs and models for works by Rome silversmiths. A student of Angelo de Rossi, Moderati was mainly active in Rome, where he was elected to the Academy of San Luca in 1721. His best known works are the Statue of the Faiths for the Chapel of Palazzo del Monte di Pietà, and the tomb of Cardinal Prioli in the Church of San Marco. 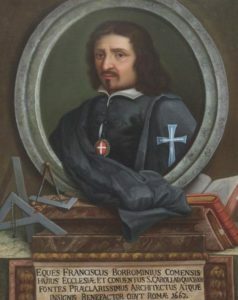 Raggi studied in Rome with Algardi and Bernini. He went on to participate in many of Bernini’s commissions, such as the Fountain of the Four Rivers on Piazza Navona, for which he sculpted the ‘the Danube’ (1650-1651). His works show soft and graceful lines, more tempered than the commanding approach of some other Baroque sculpture. Another important example is his Baptism of Christ, in the Church of Saint John of the Florentines. Carlo Rainaldi initially worked with his father Girolamo, architect for Palazzo Pamphili, situated next to Sant’Agnese in Agone on Piazza Navona. He designed the Church of Saint Mary in Campitelli (1656-1665) and was also responsible for the ‘twin churches’ on Piazza del Popolo (1661-1663), which play an important part in establishing the lines of the urban centre. Rainaldi was initially employed in the school of Domenico Fontana, who was himself a collaborator of Giacomo Della Porta. Rainaldi’s own projects continued the Mannerist tradition within the larger Roman Baroque. His activity included altars and partial renovations of church exteriors, as well as a reworking of the facade of Palazzo Pamphili (1650). Originally from Lombardy, probably with an apprenticeship in Parma, Leonardo Retti moved to Rome around 1673. His known activity at Sant’Agnese dates from 1666 to 1714. Following the death of Ercole Ferrata, Retti completed the upper part of the relief of the Martyrdom of Saint Emerentiana.